On June 13 and 14, a total of 54 equines—31 donkeys, 9 mules and 14 horses—were seen and cared for by the Animal Action team in the following areas on Amorgos: Vroutsi, Kolofana, Langada, Tholaria, Potamos, Chora and Katapola. The team also spoke and distributed leaflets for the inhumane and illegal habit of keeping the animals' legs tied together. This practice is severe and can permanently damage the legs. Instead, the team offered advice about a better way to tie a horse, mule or donkey, by using a halter and collar. 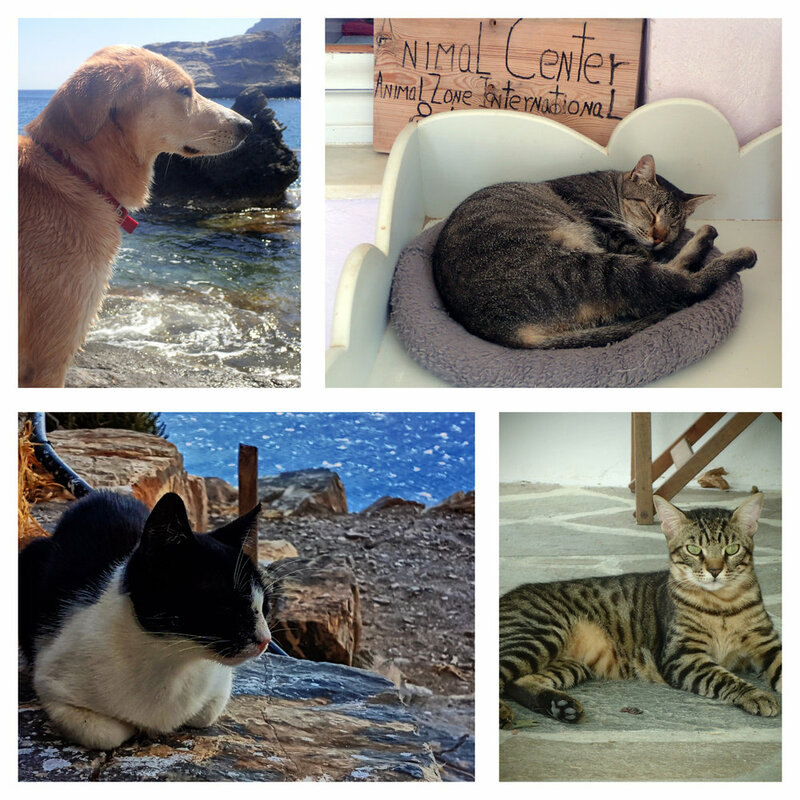 The residents of Amorgos have embraced the program and they eagerly await the annual visit of the Animal Action team. During the days of the program one of our lovely donkeys at our equine shelter, Daisy, who was already very old became seriously ill. She could not stand upright so euthanasia was deemed necessary. Daisy was a very social donkey who became the mascot of our shelter. We already miss her a lot. We want to thank Animal Action for sending their team: Kleopatra Triantafilou, a veterinarian specializing in equines, the farrier Gianni Mprastiano, our volunteers Lea Voegeli and Giorgos Zafiriou who offer us much help, and Panagiotis Psychogios (the Pensione Panos) who hosted the vet. A big round of thank yous also go to the owners of the many animals who participated in the program. In collaboration with Animal Zone International, the Equine Care team of ANIMAL ACTION will return to our island this June in order to offer its services to working animals (donkeys, horses, mules) of residents of the island for two days: Wednesday, June 13th and Thursday June 14th. To anyone who has donkeys, mules, or horses who need care, please contact Animal Zone International by phone: 22850-71716 and 6974990045 or simply bring the animal to the designated points. Both a veterinarian specializing in horses and the farrier from ANIMAL ACTION will deworm animals and will take care of hooves and animal teeth for FREE. Veterinarian Dimitrios Vasalakis will be in Amorgos on Saturday 2 and Sunday 3 of June. He will perform examinations at Animal Zone International's veterinary clinic at Pera Rachidi of Katapola. Those who care for stray cats please contact us. For more information, please contact either the veterinarian at telephone number +30 694 4278947 or AZI's program coordinator at telephone number +30 697 4990045. JOIN US FOR THE INSIDE STORY OF SALVATOR MUNDI! Robert Simon, a renowned specialist of old Master paintings and board member of AZI, was a key player in the rediscovery and verification of the ‘last da Vinci,’ the painting now known as Salvator Mundi. Christie's has called this painting “without question the greatest artistic rediscovery of the 21st century,” and, at auction last November, this masterpiece sold for an historic record of over $450 million. On the evening of April 12th, Dr. Simon will recount his part in the fascinating story behind the rediscovery of Salvator Mundi, the last Leonardo held in private hands. Join us at Sky Terrace, on the 54th floor of The Galleria, for an exciting evening of stories and magnificent views of the Manhattan skyline. Wine and Italian specialties by La Villetta will be served. This event is a benefit for Animal Zone International, a 501(c)(3) nonprofit dedicated to saving animals, improving the environment, and shaping tomorrow's future for island communities, beginning with the Greek island of Amorgos. Buy your ticket NOW! Celebrate with us on Wed Nov 15th! Please join us for a very special evening: For ten years, we've supported and rescued cats, dogs and equines throughout Amorgos. With your help, this important work can continue. Bid on art work, jewelry, luxury vacation stays, tempting household items, training sessions, private concerts in your home, and much more. See our catalog here. Come enjoy great food, drinks and company with fellow animal lovers and help support our efforts. Live music by violin virtuoso Stamatis Giannakopoulos from Amorgos with New York composer Jed Disler at the keyboard. Pay by credit card or PayPal by clicking button below, or send a check payable to Animal Zone International, P.O. Box 1039, Cooper Station, New York, NY 10003. Celebrate with us on Wed Nov 15th! Come and Suprise Your Taste Buds! A great chef prepares his dishes on the basis of what he finds at the market each day. So when we asked Chef William Mattiello which wild greens he will use for the risotto, he answers, Those that I will find at the forager’s. And if asked, the forager will answer in turn, Those that nature will make available on the day of the banquet. Come and let your taste-buds be surprised! This meal will be a full immersion in unbelievable flavors. Rest assured, however: pine-nuts, mallow, green strawberries, chamomile, wild mint, lamb's quarter, purslane, and wild fennel are more than likely to meet you at the Animal Zone Vegetarian Feast to be held at Via Emilia on Sunday, June 25th at 6pm. We will keep you posted. You’ll be the first to know what’s boiling in Chef’s Mattiello’s crucible. A double surprise: behind each wild green there is a legend, a myth, a story you'll be happy to learn. Table food will be accompanied by table talks provided by food historian Luigi Ballerini. Some of our animal friends’ best friends are human friends. On November 17th, we were happy to be counted among those friends on an evening when Animal Zone International brought us all together at the Via Emilia Restaurant where Chef William Mattiello was waiting with his Modenese specialties and Maestro Jed Distler had gathered a group of musicians to serenade us with great music ranging from classics to fabulous arrangements of their own tunes. The evening was one of magic for those of us who had come to celebrate another year of working for the health and the healing and the well-being of the animals of the island of Amorgos. At this time of year there are many galas and benefits, glittering bejeweled affairs in honor of charities and foundations, but this was a special one. The food and the wine and the music was being shared by a group of people who had become devoted to the idea of helping the most vulnerable among us—and artists and photographers had donated remarkable works for us to bid on, which meant that not only could we go home with one of these works, we had the pleasure of knowing that the money being raised would go straight to Amorgos and the stray cats and kittens and barrel dogs and donkeys and abandoned horses and mules who so desperately needed our help. There were many other things to bid on, weekends in the country, jewelry, hotel stays on the island itself, and it was clear that a great number of people cared about our project. Next year, Animal Zone International will once again create a night in which we can come together to celebrate their incredible work and I will be there, sharing in the joy of knowing that the pleasure of our evening will bring safety and comfort to the members of our beloved animal kingdom. Join us in NYC on Thursday, November 17th for a spirited private party. Celebrate with new-found friends, live music, cocktails, extraordinary pasta (gluten free options available), fine vegetarian dishes and a silent auction featuring art, jewelry, and travel exclusives from Greece. Since 2007, AZI has been working with the community of Amorgos and volunteers worldwide to educate children and create a sustainable environment for every person and every animal of the island. Your generosity will help provide food, shelter, medicine for the animals, new educational opportunities for the children and a model of sustainability that can be repeated anywhere. When you share your support for the animals, the community thrives. Make a tax-deductible donation or find out new opportunities to volunteer, adopt animals, and travel to the island. AZI is a nonprofit tax-exempt organization under section 501(c)3 of the United States Internal Revenue Service code. All gifts are tax-deductible to the extent allowable under the law. In collaboration with Animal Zone International, the Equine Care team of ANIMAL ACTION – GAWF will return to our island this June in order to offer its services to working animals (donkeys, horses, mules) of residents of the island for three days: Thursday, June 23rd, Friday June 24th and Saturday June 25th. Whoever has donkeys, mules, or horses who need care, please contact Animal Zone International or simply bring the animal to the designated points. Both a veterinarian specializing in horses and the farrier from ANIMAL ACTION will deworm animals and will take care of hooves and animal teeth for FREE. Hotel and Spa Vacation Packages to Amorogos! We are getting excited about our upcoming fundraiser on November 4th! Auction items are coming in; spectacular art and photography including works by Eric Amouyal, Mark Kostabi, Jan Meissner, Kathy Shorr, Charles Traub and William Wegman. 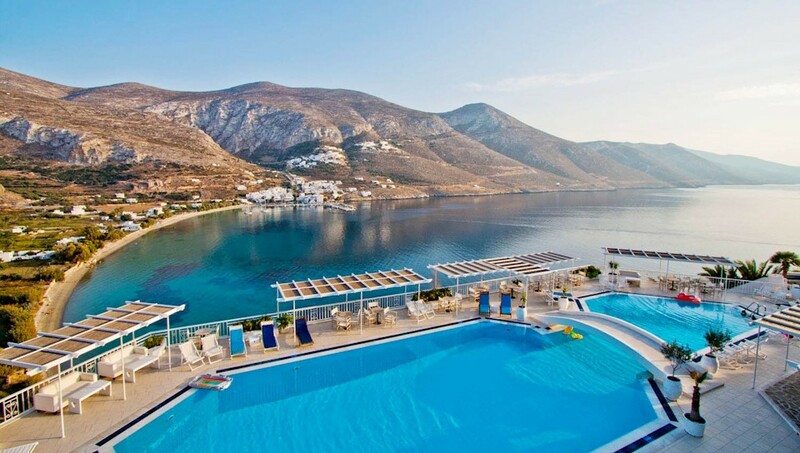 Also many vacation packages from hotels in Amorgos such as the Aegiali Hotel and Spa (photo below) and the Hotel Minoa. Join us for the Argos Gala! Animal Action–GAWF's annual visit went very well this year in Amorgos. On June 26-27, 2015, a total of 53 animals were examined and received veterinary care, including 10 horses, 9 mules and 34 donkeys. For first time we had visitors in Ormos (8 animals). In collaboration with Animal Zone International & Filozoiki Merimna of Amorgos, the Equine Care Team of ANIMAL ACTION–GAWF will be making its annual visit to Amorgos in order to offer free veterinary, hoof and dental services to working animals—donkeys, horses, mules. This will take place on Friday, June 26 and Saturday, June 27th. Anyone with donkeys, mules, horses that are in need of care can contact Animal Zone International at: 22850-71716 or 6974990045. Our two-day vaccination program took place on June 8 and 9th on Amorgos. This is a crucial part of our mission to keep the feral cat population healthy and clear of disease. To AZI Friends and Supporters: please consider making a donation to help us fund this program. To Litsa, our coordinator, and the amazing volunteer vets—a big warm-hearted thank you! 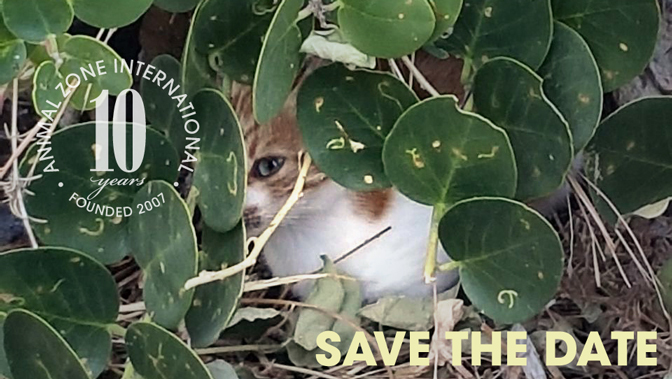 We are planning a 2-day vaccination program of stray cats on Amorgos for Monday, June 8 and Tuesday, June 9 with the Greek Volunteer Vets. This program is a crucial part of our mission to keep the feral cat population on the island healthy and clear of infectious disease. To AZI Friends and Supporters: please considering making a donation to help fund this program. Thank you! We are planning an extra-exciting fundraising dinner on June 21, 2015: Leonardo's Dinner. Put it in your calendars! Hope to see you there. Click here to read more about it.